In the Gold Rush era, Oakland supported more than FORTY breweries. In the post-Prohibition era, Oakland supported... definitely-not-FORTY breweries. And while it took some time (92 years! 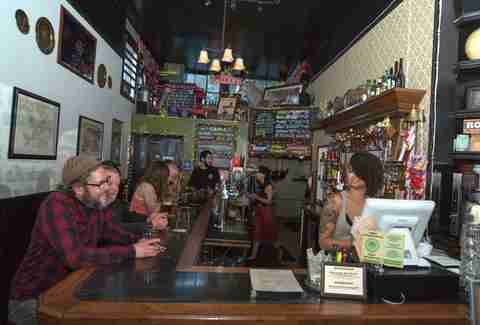 ), Oakland is finally returning to its sudsier glory days, with brew pubs and beer bars sprouting up faster than you can say "fixie-mustache-fanny-pack-jorts." 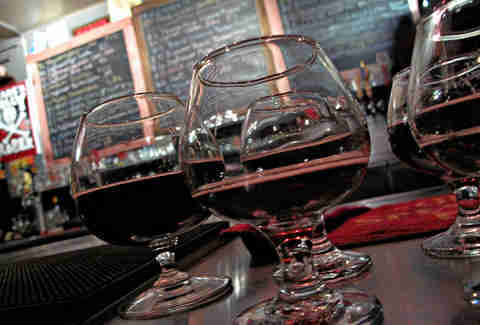 Bored with Toronado and Monk’s Kettle? Then BART, Uber, or sober-friend yourself over the bridge to throw back a pint on the sunny side of the bay at one of these. 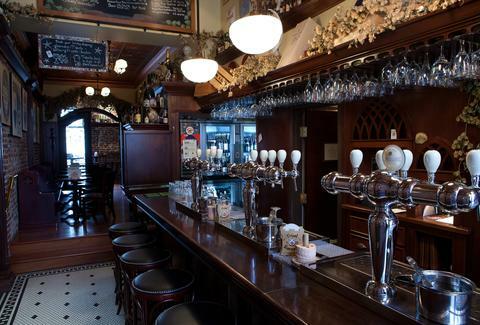 Housed inside a Victorian building from the 1870s, The Trappist models itself after an old Belgian pub and has the lengthy list of hard-to-find frites-country ales on tap to prove it -- plus plenty of US (especially California) microbrews and more than 100 bottles. Also cool: the roomier back bar has a different selection than the dark, cozy front bar -- whichever you choose, the bartender will properly pour your beer into the proper glass. Properly. And in case you get only medium hungry: the minimalist menu offers cheeses, charcuterie, and other bites meant to go well with beer. If you’re starving for sunshine and a raging game of ping-pong/corn hole, you're gonna want to find your way to Lost & Found. 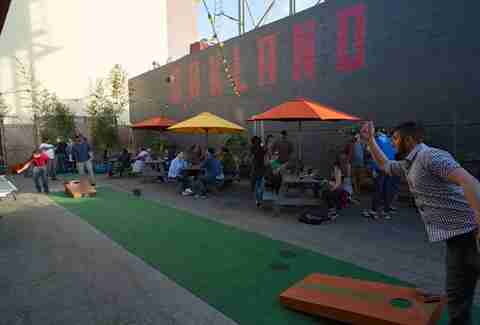 The beer garden has 24 brews on tap -- mostly local Belgian-style, stouts, and IPAs -- which you can sip outdoors in a large communal space decorated with greenery, bean bag chairs, and a killer mural. The inside bar is modern and spacious, but outside is where it’s at. Oh, and try the fried ramen noodles because, fried ramen noodles. 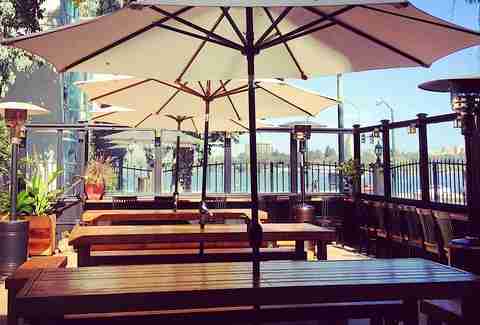 On the East side of Lake Merritt, between Merritt Bakery and a tattoo parlor, Portal is a slender bar that opens up to a roomier outdoor patio with picnic tables (sit out there), sunbrellas, and a view of the lake. Drinks-wise, there're 15 tap beers, mostly but not entirely Californian, and at least one cider (Crispin), while eats-wise small plates include pickled things, salads, and frites, as well as mini-burgers and something called “garbage bread,” which could be/definitely 1,000,000% will be just the ticket after a few rounds. A Downtown standby that's been around since 1988 (when it was one of the only games in town), Pacific Coast Brewing is the kind of place you could bring your dad to watch a football game without it being weird. The brewpub has 24 selections on tap, up to 10 of which are done in house -- try the uber-dark Leviathan or the BBA Sour Cherry Mermaid’s Revenge, which the brewmaster wants "served at his funeral." The menu offers a standard mix of fried things, sandwiches, and beer-battered fish tacos. 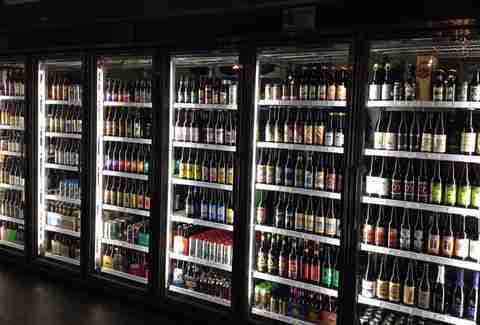 Affectionately called Beer Rev, what this beer bar/bottle shop lacks in frills it makes up for in selection. The smallish, narrow bar offers 50 rotating taps, which could include anything from a Hoparillo Triple IPA, to a Dust Bowl pilsener, to Caldera Mogli barrel-aged porter from Ashland, Oregon. The coolers are stocked with 100+ bottles to drink at home or in either of two seating areas: 1) inside, where you'll get punk rock vibes and limited seating (it’s less crowded in the afternoon), and 2) outside, where you'll find picnic tables and people-watching. Pro tip: pick up a burger from Annex Burger next door. A neighborhood spot that calls itself a gastro-pub (but doesn’t have the pretentiousness that the term implies), Grand Tavern is located on the bottom floor of a renovated house where it slings a handful of draft beers -- including local favorite Linden Street -- and bottles. The menu features burgers, lamb shepherd’s pie, and vegetarian-friendly small plates, most including seasonal, local ingredients. 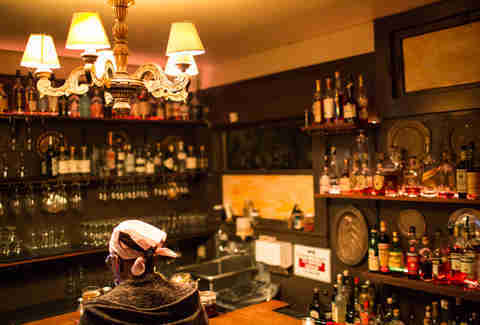 For the non-beer drinkers, GT has a killer cocktail and wine list. Oh, and addictive hand-made potato chips. If you can, snag a seat by the fireplace. Not only can you drink beer from one of Diving Dog’s 30 taps, you can also make your own. 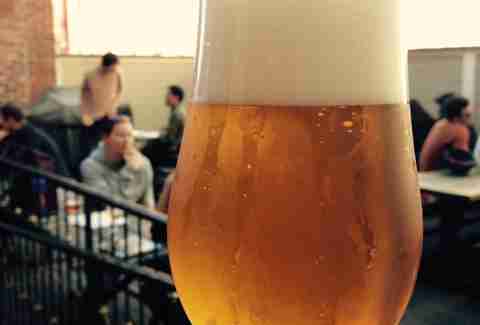 The beer bar, brewery, and brew-on-premises spot in Uptown Oakland provides DIY options for those that want to have their way with hops. The menu includes craft beers from California, Oregon, the East Coast (Pretty Things, Dogfish Head), and Louisiana (Abita). No food here, but the small spot will let you bring in food from nearby establishments. Watch for occasional pop-up kitchens, too. 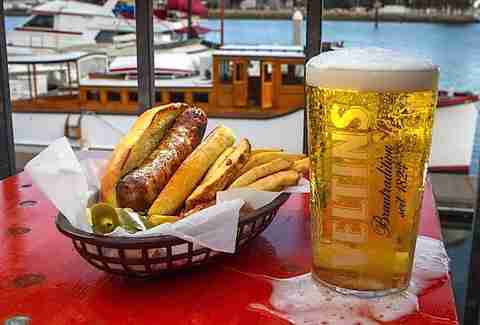 Situated on the Oakland waterfront in the no-man’s land beyond Jack London Square and behind a Homewood Suites motel, Brotzeit is what would happen if a German biergarten had a baby with a waterfront bar. You'll get waterfront views whether you're in the beer hall inside or the beer garden out, plus 30 or so beers that lean toward hard-to-find German varieties, with a few Belgian and local ales mixed in. Pair that Dunkel with sausage, a burger, and/or/but-probably-not-or fish & chips. The Good Hop's beautiful row of coolers houses about 350 bottles and cans from around the globe. Take your good fortune home or sip it in this new, Indiegogo-funded spot. In addition to the fridge-stuffs, TGH offers 16 mostly California beers on tap. It’s located at Telegraph and 24th St, not far from the Fox Theatre and all of this. Analog keeps things simple and old school. Like, really old school: a jukebox, tube TV with ‘80s Nintendo, and vinyl. The beer list is small but well chosen: Ommegang Hennepin, Sculpin IPA, Old Rasputin. Choose from sandwiches called the Miss Piggy (BBQ), the Ham On! !, and the Hail Seitan, plus look for visits from pop-up kitchen Hella Vegan Eats, a Sunday vegan brunch, and record swaps, which are apparently a thing now. If you’re tired of craft beer and just want a Guinness, and maybe a soccer game, and maybe something warm to eat, you will find that here. The homey neighborhood pub has a dozen or so beers on tap --Fullers, Drake’s, Linden Street -- and a British-heavy bottle selection. Pair that pint with English pub fare any time of day, except late at night: they will kick you out at 11pm. Note: ample bike racks are just around the corner on 29th St. Also -- CommonWealth recently opened a second location in Emeryville, FYI. Heather Johnson is an Oakland-based writer that has gotten sunburned at Beer Rev, and Brotzeit, and celebrated a birthday at Trappist. She has a low tolerance, aka is cheap date.